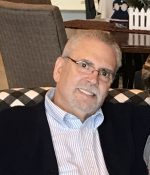 Remembering David E Dews | Remembering David E Dews | De Soto Obituary Search | Dietrich-Mothershead Funeral Home, Inc. Remembering David E Dews | De Soto Obituary Search | Dietrich-Mothershead Funeral Home, Inc.
David E. Dews was born May 22, 1959 in Fulton, MO. A son to Clark and Bonnie (nee Williams) Dews. He died at his De Soto home on March 18, 2019 at the age of 59. David was the city manager of De Soto from 1999 to 2017 and was currently serving as executive director of the Jefferson County Economic Development Corporation. Mr. Dews also served for seven months on the De Soto Board of Education in 2016 and 2017 to fill a vacancy. He was the honorary chairman and spoke as a cancer survivor at the Festus Relay for Life in 2014. Mr. Dews held bachelor’s degrees in business administration, civil engineering, and chemistry. He was a member of the Missouri Economic Development Council, the Jefferson County Growth Association, the Highway 21 Task Force (serving as its chairman since 2015) and the Safety First Coalition. He was past president of De Soto Rotary Club, De Soto Chamber of Commerce and the De Soto Community Foundation and was chairman of the Hwy. 21 Task Force. He also was on the EDC board from 1999 to 2017 and was its chairman for 14 years before he stepped down after he was named the executive director. He is survived by his wife Patricia “Patty” (Marshall) Dews; two step children: Jacob (Amber Lashley) Reando of Festus, MO and Jessica (Corey) Powell of De Soto, MO; six grandchildren: Logan, Sam, Leah, Griffin, Kolton, and Lane; one sister: Sandra (Mark Shoemaker) Fuchs, Owensville, MO; two brothers: Don (Diane) Dews, Columbia, MO and Randy (Heather) Dews, Lincoln, NE; three nieces: Sarah, Amy, and Kylie; one nephew, Conner; his father-in-law and mother-in-law: Martin and Bertha Marshall of De Soto, MO; brothers-in-law, Marty Marshall of Chesterfield, MO & Kenneth Marshall of De Soto, MO; and sister-in-law, Rhonda (Ralph) Pelliccio, Jefferson City. He is preceded in death by his parents.